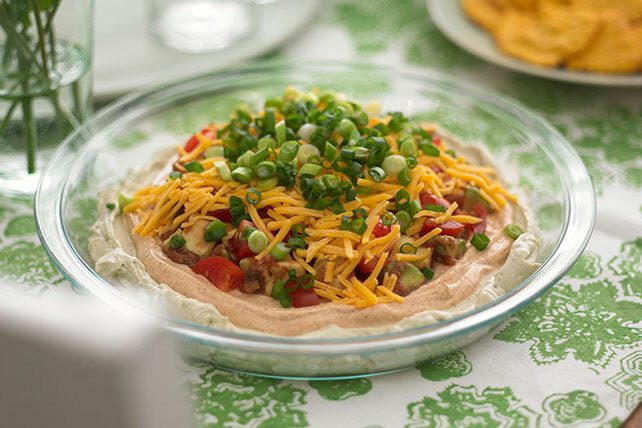 Dip into party time fun with this crowd-pleasing Six-Layer Dip recipe. True to the belief that more is merrier, this delicious six-layer dip is a chip's best buddy. The combination of salsa, cheddar cheese, sour cream, cream cheese, tomatoes and onions stacks up! Mash half the avocado with cream cheese until well blended; spread onto bottom of pie plate. Mix sour cream and seasoning mix; spread over cream cheese mixture. Chop remaining avocado; mix with salsa. Spread over sour cream layer; cover with remaining ingredients. Serve with RITZ Toasted Chips Cheddar. Store remaining taco seasoning mix in airtight container or resealable bag at room temperature. Use to make another dip or reserve for another use.